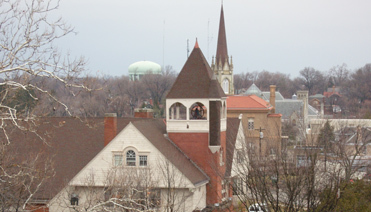 Westwood's history begins with early Cincinnati, founded in 1788 and an incorporated village by 1802. The advance of ancient Kansan glaciers that formed the Ohio River left a great amphitheater of hills and three deep interglacial valleys surrounding a natural river landing, creating early nineteenth century Cincinnati's strategic river position. Early Cincinnati's purposeful location along the Ohio River became its driving force for settlement. With Thomas Jefferson's Louisiana Purchase in 1803, early Cincinnati stood at the entrance to the nation's new "western country," stretching from the Mississippi River to the Rocky Mountains. A variety of immigrants and travelers poured through Cincinnati on the way west on the Ohio. Taverns, hotels, and a waterfront clamoring with imports and exports established Cincinnati as an early and important river town. As the first major inland municipality west of the Alleghenies founded after the Revolutionary War, commerce and trade fueled Cincinnati's growth. The introduction of steam navigation on the Ohio River in 1811 and the construction of the Miami and Erie Canal from 1826-1835 aided the city's early expansion. Hungry markets required new sources of goods and produce to fill traveler's needs, a demand the river and canal alone could not fill. Development of significant inland travel bringing new commerce to early Cincinnati could not take place without the construction of suitable roads to its prized markets. Of the three valleys leading into Cincinnati, only Mill Creek Valley's gentle fall allowed early, principal roadways to reach the town. To the west of Mill Creek Valley laid the rugged limestone and shale escarpments locals called the "Highlands" (present day North Fairmount). Steep grades kept most people from venturing further. The ancient receding glacial ice sheet had carved only a small, steep opening through which pioneers could pass. Used by bison to reach Mill Creek, the trail descended down the rocky face of Fairmount into a natural opening to the floor of Mill Creek Valley at Lick Run Gap, just two miles from Cincinnati's compact basin. Wagon trails stopped at the base of the hill at Walker's ford (north of present day State Street and Harrison Avenue) before the perilous crossing of Mill Creek. Northwesterly up the crude wagon trail hacked out by early settler Jacob Johnson, beyond the steep ridges overlooking Mill Creek, early settlers found a high, wide, and fertile land table, rising hundreds of feet above Cincinnati's basin and extending many miles west to present day Westwood. This westernmost peneplain bore dense forests with carpets of ample undergrowth. Giant red and white oak, black walnut, ash, poplar, elm, "sugar" (maple), and beech trees filled the landscape. Near the center of Section 9 in unincorporated Green Township, where the land was level and beech trees plentiful, was an area the locals called "Beech Flats." Groves teemed with deer, turkey, wild boar, and small game. A remote, abundant wilderness awaited settlers willing to scale the steep, narrow opening at Lick Run Gap.